This book is the first available survey of English agriculture between 1500 and 1850. Written specifically for students, it combines new material with an analysis of the existing literature. It describes farming in the sixteenth century, analyzes the reasons for improvements in agricultural output and productivity, and examines changes in the agrarian economy and society. 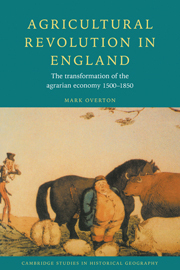 Professor Overton argues that the impact of these related changes in productivity and social and economic structure in the century after 1750 amount to an agricultural revolution. Preface; A note on weights, measures, money and boundaries; 1. The agricultural revolution; 2. Farming in the sixteenth century; 3. Agricultural output and productivity, 1500–1850; 4. Institutional changes, 1500–1850; 5. The agricultural revolution reconsidered; Guide to further reading; Bibliography.